We’ve all been there. That moment when you come to a 4-way stop and aren’t sure who get’s to move first. It can be a frustrating experience but more importantly, it can be hazardous. 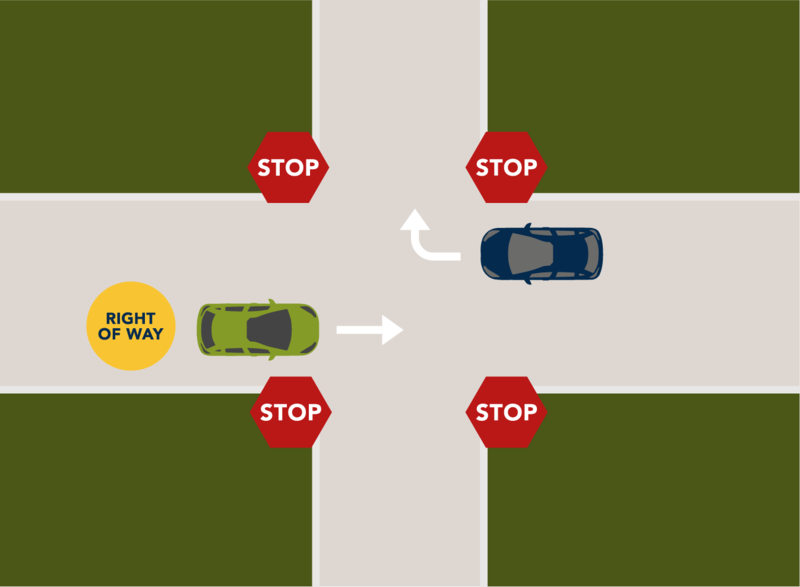 So, follow these 4 rules to a 4-way stop to keep traffic flowing smoothly and safely. 1. First come, first served. This applies to the road too. If there is no traffic light but rather a 4-way stop, the first car to arrive at the intersection receives the right of way. It doesn’t matter where the vehicle is located or what direction it is traveling, this rule will always apply when someone has clearly arrived at the stop sign first. However, still be wary of aggressive or distracted drivers that may dismiss this rule. 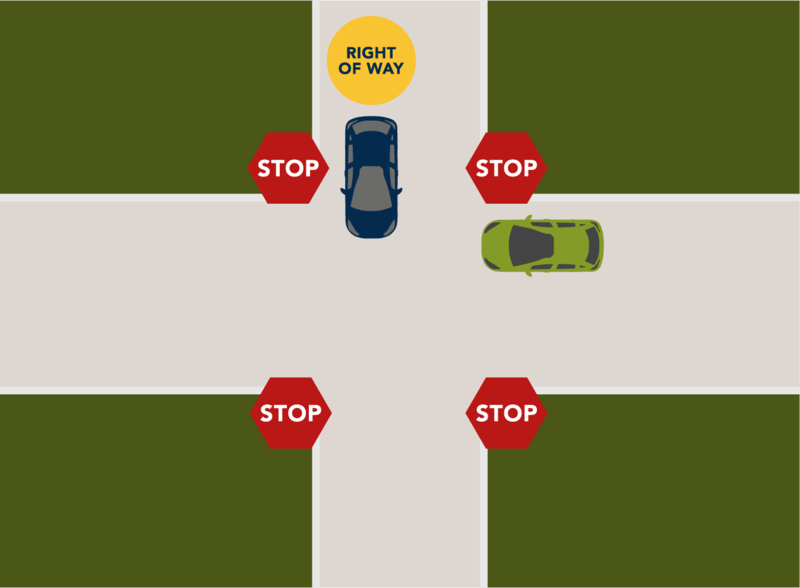 When two vehicles arrive at a 4-way stop at the same time, and are located side-by-side, the vehicle furthest to the right has the right of way. If three vehicles arrive at the same time, the car furthest left should continue to yield until both of the other cars to the right of them have passed. When arriving to an intersection head-to-head with another vehicle, it is important to use signals. When two vehicles arrive at a 4-way stop at the same time, and they are located head-to-head and one of the vehicles intends to turn and the other intends to go straight, the vehicle going straight has right of way. Keep in mind that if both vehicles are going straight or turning in the same direction, they can both proceed at the same time as they will not cross each other’s path. When two vehicles arrive at a 4-way stop at the same time, and they are located head-to-head and one of the vehicles intends to turn right and the other intends to turn left, the vehicle turning right has right of way. Move forward slowly before entering the intersection to indicate to other drivers you are making the turn. The driver turning left should wait until the other car has fully passed. You may be wondering what happens if all four cars arrive at the intersection at the same time? There is no good rule of thumb as to who should go first. However, it is recommended that you wait for the most aggressive driver to make the first move and then proceed with caution using the rules above from there. 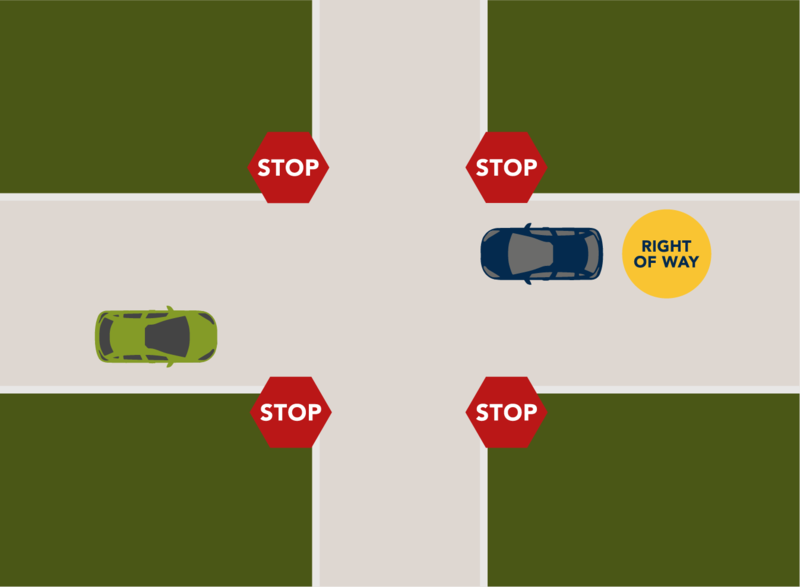 Overall, it’s important to be patient and alert when approaching a 4-way stop. Interested in learning more from Top Driver? Click here to check out our full list of safe driving tips or contact us directly! This entry was posted in Top Driver Blog and tagged 4-way stops, Driver Education, Driver Safety, Driving Tips, Traffic Laws.